City rod Paul Rayner topped a very strong field in the Saturday Peterborough & District AA Open at Ferry Meadows. Drawn on peg 11 on the Overton Lake, Rayner fished a medium sized groundbait feeder netting bream to 7lb on worm and caster to record 63lb 15oz. Pete Wood came second on 58lb 13oz, then it was Nigel Bayler with 55lb 15oz. 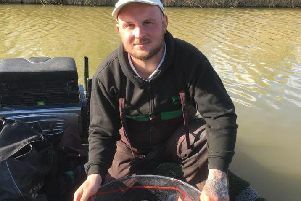 In the Peterborough & DAA club match fished on the High Bank pegs at Ferry Meadows on Sunday it was Paul Dotchin topping the small but strong field. He caught on the pole with worm and caster weighing in 19lb 8oz. Mel Saggers came second on a level 19lb followed by Graham Page with 12lb 8oz. Its all change at the top of the table at Peterborough & District AA. Andy Jackson has stepped down as secretary with immediate effect and John Newman has taken over the role. Lindsey Horsman will continue as club treasurer but a little later in the year Jason Wilmer will take over from Pete Garrod as the new booking secretary. It’s been a busy two weeks for the recently formed Tuesday Club. Roger Biddle won their match on the High Bank pegs at Ferry Meadows with 14lb. In the latest match at Eldernell Fishery it was Dave Steele leading the way. He was on peg 12 and caught carp on luncheon meat fished close in. Jeff Tuttlebee came second he caught small fish on the waggler with maggot and took a few better samples on the pellet and pole late on for 36lb 8oz. Third with 23lb was Mike Mohan, another angler on the pole and meat approach.